Amazon . memory foam mattresses . Acritum Sophisticated Rename is a powerful Windows utility that simplifies the batch processing of various types of files, including photos and music. Limited-time offer! 50% discount until 24th April (Wednesday). During short promo period the price for SR with FREE LIFETIME UPGRADES is only $29.95!!! Hurry up, the number of SR copies to be sold at the promo price is limited! Grab your one NOW! The program allows you to create an unlimited number of presets containing dozens of settings. Each preset can be quickly loaded by clicking on a corresponding shortcut. The most prominent feature of the program is that it doesn’t use predefined rules of renaming. The user specifies the rules for a certain renaming task with the help of visually adjustable data types. For example, variables can extract specific parts of the original file names, counters can enumerate files both in numerical and alphabetical ways, conditionals allow you to apply different renaming patterns depending on the desired conditions, for example, the date or contents of the file. The number of such items in the renaming template is not limited. A real breakthrough in the renaming software is the introduction of renaming plugins, which can be easily written in any programming language. A plugin can be the only solution for the user when all other renaming programs fail to solve the required task. The programmers from over the world have already created a few free useful plugins. For instance, RegExpSR enables to use search-and-replace feature with regular expressions. Besides the renaming functions, Sophisticated Rename is also capable of changing file attributes, date, time and the case of name and extension (there are 5 predefined types). Webmasters will find it useful to rename multiple files on FTP servers – you can use ordinary templates to do it! There are 3 different ways to proceed with remote renaming process and you can do it even if you don’t have local copies of the files which are going to be renamed. Sophisticated Rename will certainly spark the interest of photographers because it has internal Exif viewer and editor for jpeg and tiff files. Exif viewer can show and print a filtered set of any Exif tags for multiple files. Exif editor can also conduct various Exif date and time manipulations, such as time shift for the photos with wrong time settings. The user can also set the date and time of files in accordance with Exif date and time. 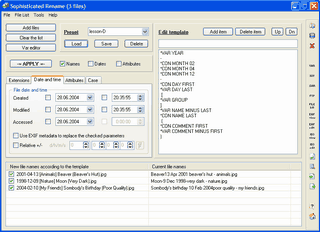 The editor can handle either each file separately or all files at once. Music lovers should also be delighted as almost the same editor is implemented for MP3 ID3 v1/v2 tags. It’s worth mentioning that the user is able to reduce any Exif or ID3 tag and easily insert it to the renaming template. As far as file safety is concerned, Sophisticated Rename offers a real-time preview for any change in the renaming template. It means that the user doesn’t have to rename files to see how the template works. Moreover, it is possible to restore old file names even after the renaming process. The program also keeps the log of all operations, so it’s easy to check the old file names of previous renaming processes.